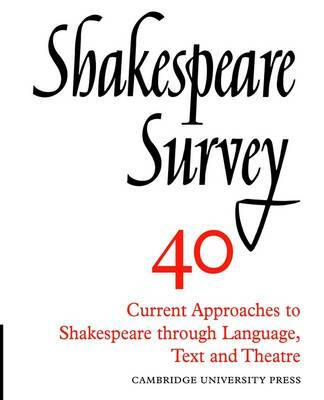 Shakespeare Survey is a yearbook of Shakespeare studies and production. Since 1948 Survey has published the best international scholarship in English and many of its essays have become classics of Shakespeare criticism. Each volume is devoted to a theme, or play, or group of plays; each also contains a section of reviews of the previous year's textual and critical studies and of major British performances. The books are illustrated with a variety of Shakespearean images and production photographs. The current editor of Survey is Peter Holland. The first eighteen volumes were edited by Allardyce Nicoll, numbers 19-33 by Kenneth Muir and numbers 34-52 by Stanley Wells. The virtues of accessible scholarship and a keen interest in performance, from Shakespeare's time to our own, have characterised the journal from the start. For the first time, numbers 1-50 are being reissued in paperback, available separately and as a set.